Home→Ayurvedic Diet and Eating Habits→What and How Much Should I Drink? ← Tampons and Pads – Watch out! Pitta types need a moderate amount; and Kapha types need the least. To learn about your Dosha see Dosha test; What is Ayurveda; and Prakriti – your unique constitution. It is good for a Vata person to have a large glass of warm water first thing in the morning, especially when constipation is a case. For the rest of the day, they should only drink when thirsty. Fiery Pittas can drink up to eight glasses of water during the day. Watery Kaphas need little or no water and should drink only when thirsty. If you are a Kapha type and are thirsty all the time, then your metabolism is not running correctly. You should see your health care (Ayurvedic) provider. If you are a Vata or Pitta type and have such imbalances as dry skin; skin problems; or excessive signs of heat in the body such as skin rashes, flushed face, dandruff, and burning or red eyes, try drinking additional four glasses of warm water upon waking. Drinking fruit or vegetable juices occasionally is good for everyone and has many beneficial effects on your health. But again, their properties vary greatly and they should be consumed depending on your constitution. You can find this information in the article Ayurveda and Fasting and Ayurveda on Juices. Coffee, tea, soft drinks, and alcohol are all damaging to the kidney function and the water metabolism. Pops and soft drinks rob the body of precious minerals and destroy the water metabolism and should not be used at all (see also Junk food and Ayurveda). 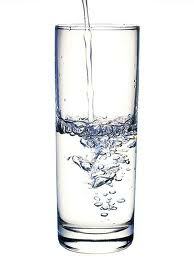 Clean water, pure fresh fruit or vegetable juices (better diluted with warm water), or herbal teas are the best options. To promote good digestion have a cup of warm drink such as herbal tea or chai with your meal. At the end of the meal a cup of lassi is an excellent aid to digestion (see Lassi – yogurt that is good for you). Dairy is another big topic to discuss. Read about it in one of my previous articles Dairy and Ayurveda. TODAY’S TIP: Ayurveda does not recommend cold drinks at any time, because it is shocking to the system and can kill the digestive fire. Just think about it next time you’ll be offered iced water before meal. I am interested in Ayurveda and wonder if you can explain what exactly happens when I drink too much water. I’m looking forward to reading more of your posts. Plasma, an oily liquid, is depleted by exessive amounts of water. The kidneys become fatigued. Vata people become tired and weak, Kapha persons bloat and hold excess water. Fiery Pittas are the only Dosha that seem to be able to process larger amounts of water.